A tall, rank, bristly herbaceous perennial with blue, violet or purple tubular flowers and (normally) no wing running down the stem, or the wing poorly developed. A common plant of waste ground, rubbish dumps, roadsides etc. ; formerly grown as a fodder plant. Generally more frequent than S. officinale. This is the hybrid between Symphytum officinale, native to the British Isles and S. asperum from SW Asia. The poorly developed stem wing is one of the characters that distinguishes it from S. officinale, but like most hybrids it is very variable and shows various combinations of the characters of the two parent species. 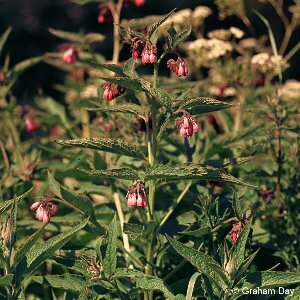 All names: Symphytum asperum x officinale (S. x uplandicum) Nyman; Symphytum x uplandicum Nyman; Symphytum asperum x officinale; Symphytum peregrinum auct. ; Symphytum lilacinum auct. 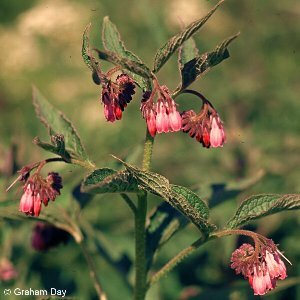 ; Symphytum densiflorum auct. 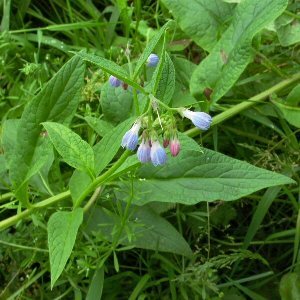 ; Symphytum caeruleum auct.